The usual route in a calf workout is to do calf isolations. But there are other possibilities. Put some variety into your calf training! This tip is more for the at-home trainees. It deals with adding more (heavy) work to your calves without resorting to the usual calf raise-type isolations. Usually, when something like that is mentioned, it involves going out and doing sprints or pushing the prowler or maybe climbing a hill. My approach is simpler and a bit more practical, involving just a few exercises. The added benefit is that exercises used are themselves bang-for-buck exercises, and adding them into your routine is generally a smart move even if you don’t need a helping hand with growing your calves. We described the first exercise in this installment of the series, and that’s the split squat. Keeping your entire bodyweight + added weight on one leg only during a squatting movement makes your calf work hard in order to stabilize the movement (on top of plantar flexion that is present in any compound squatting movement). Personally, every single time I do these I get a calf pump on the front leg. Moreover, getting calf pump on the right leg only when I was just starting out was a hint to me that I hadn’t been keeping my weight properly on the front leg when doing the left side. A thing to watch out for is keeping your weight centered closer to the heel than to the ball of the foot – there’s no need to sacrifice good form on the split squat just to get a bit more calf stimulation. 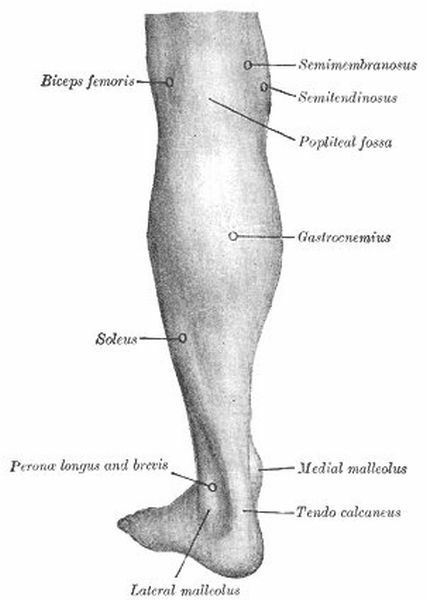 The gastrocnemius is a large muscle in your calf. The second exercise is also a must for the home trainee, and that’s the (assisted) floor hamstring raise (sometimes referred to as the “Nordic curl”). The setup is extremely easy to make – get a heavy barbell (I currently weigh around 85 kg, and load my barbell with 140 kg), put some smaller plates around it so it doesn’t move, and put some cushioning on the floor and around the barbell itself so your knees and ankles don’t hurt while you perform the exercise. I purposely don’t call this exercise a “glute-ham raise”, or “glute-ham-gastroc raise”, as it has recently been named due to the recognition of the work the gastrocnemius must do at the end of the movement, because the “real” GHR is done on a special apparatus, and the floor version has several drawbacks to it (more on that on another occasion, maybe). The important thing is that the second half of the movement is basically the same, and this means a lot of hard dynamic work for your calves. On more than one occasion, I had to interrupt my set and crawl like a paraplegic away from the bar because of severe calf cramps (they usually occur near the end of a set). Naturally, any exercise involving significant knee flexion (the many variants of the leg curl) will exhibit this favorable effect as well, although it usually takes the loading of a glute-ham raise to make people realize that. Furthermore, the fact that gastrocnemius fires the most near the top of the movement poses a problem for home trainees whose only leg curl option is the plate-loaded lying leg curl variant, since it has almost no resistance at the end part of the ROM. Gym trainees, who can do leg curls on various counterweight machines won’t have this problem. There are some drawbacks to this approach, mostly regarding the fact that your calves won’t be the limiting factor in any of these exercises, hence the “adding more work” part in the title – the mainstay of your calf training should still be the calf raise. Another possible drawback is that you won’t feel your calves at all during either hamstring raises or split squats, but, as I’ve just said, I have yet to see a trainee who hasn’t experienced severe calf cramps when trying floor hamstring raises for the first few times. Up next: Bench Pressing Cues for Shoulder/Arm Dominant Trainees! Pictures courtesy of “carygrant” and Wikimedia. Funny – I used to work my calves harder and just recently have started again. I’m going to have to reread to fully get that move but I’m sure it will be a good one to try! Thanks! I will definitely have to try this. For some reason I have always had trouble building my calves – usually have been doing calf raises with free weights in the past. Maybe this will help. Great post, an area I’ve never wanted to target but def useful for clients.